Read the question first, so you know what you are going to have to answer. Read the story slowly and carefully. Pay close attention to the facts. Read. 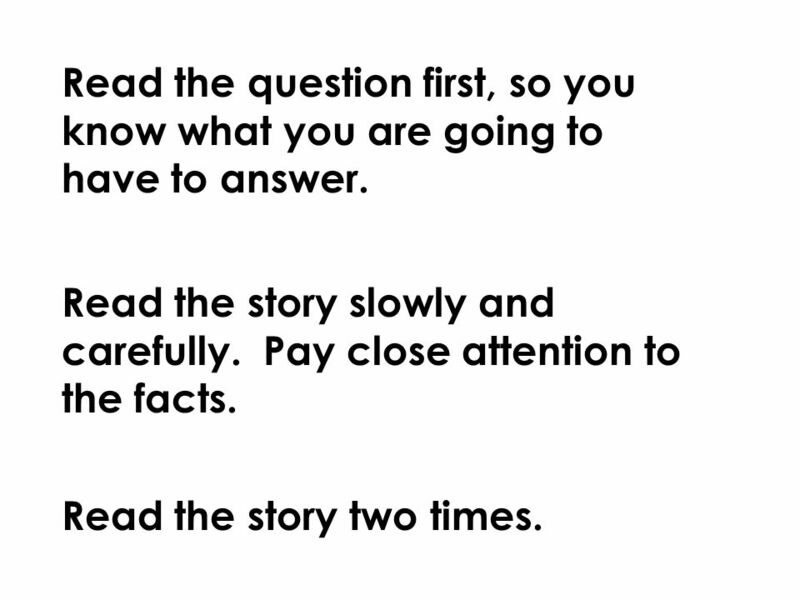 3 Read the question first, so you know what you are going to have to answer. Read the story slowly and carefully. Pay close attention to the facts. Read the story two times. 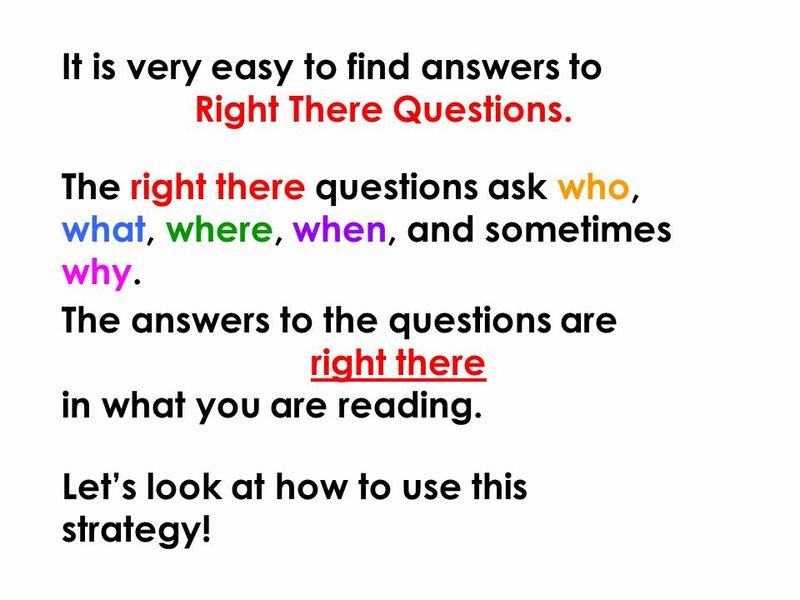 4 It is very easy to find answers to Right There Questions. The right there questions ask who, what, where, when, and sometimes why. The answers to the questions are right there in what you are reading. Let’s look at how to use this strategy! 5 1. What did Penny like to do? 2. What she didn’t like to do? 3. When was her favorite time of day? 4. What did she dream of doing? 6 The Pencil Penny was a yellow number 2 pencil. 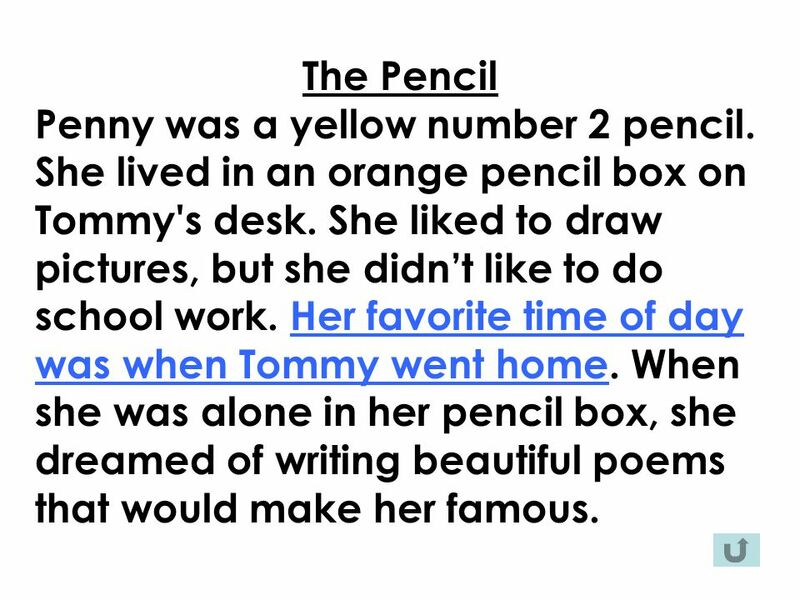 She lived in an orange pencil box on Tommy's desk. She liked to draw pictures, but she didn’t like to do school work. Her favorite time of day was when Tommy went home. When she was alone in her pencil box, she dreamed of writing beautiful poems that would make her famous. 7 The Pencil Penny was a yellow number 2 pencil. 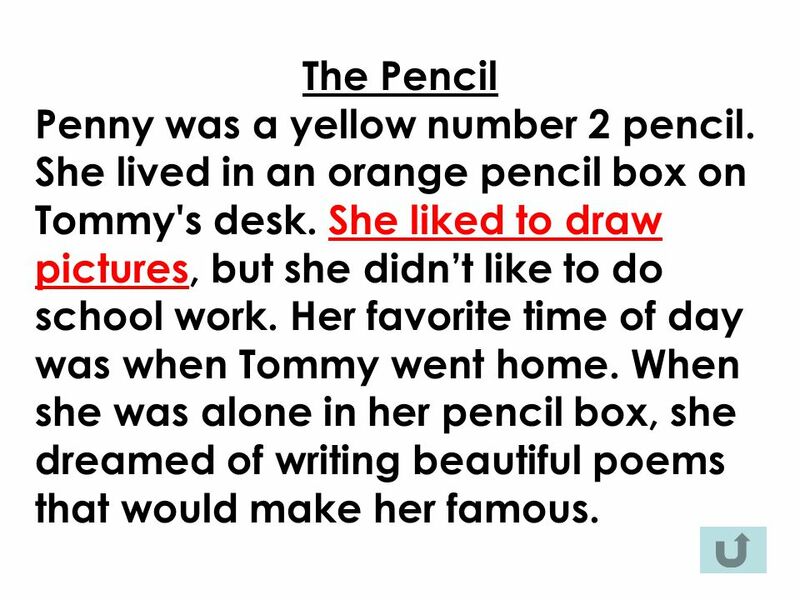 She lived in an orange pencil box on Tommy's desk. She liked to draw pictures, but she didn’t like to do school work. Her favorite time of day was when Tommy went home. When she was alone in her pencil box, she dreamed of writing beautiful poems that would make her famous. 8 The Pencil Penny was a yellow number 2 pencil. She lived in an orange pencil box on Tommy's desk. She liked to draw pictures, but she didn’t like to do school work. Her favorite time of day was when Tommy went home. When she was alone in her pencil box, she dreamed of writing beautiful poems that would make her famous. 9 The Pencil Penny was a yellow number 2 pencil. She lived in an orange pencil box on Tommy's desk. She liked to draw pictures, but she didn’t like to do school work. Her favorite time of day was when Tommy went home. When she was alone in her pencil box, she dreamed of writing beautiful poems that would make her famous. 10 The Pencil Penny was a yellow number 2 pencil. 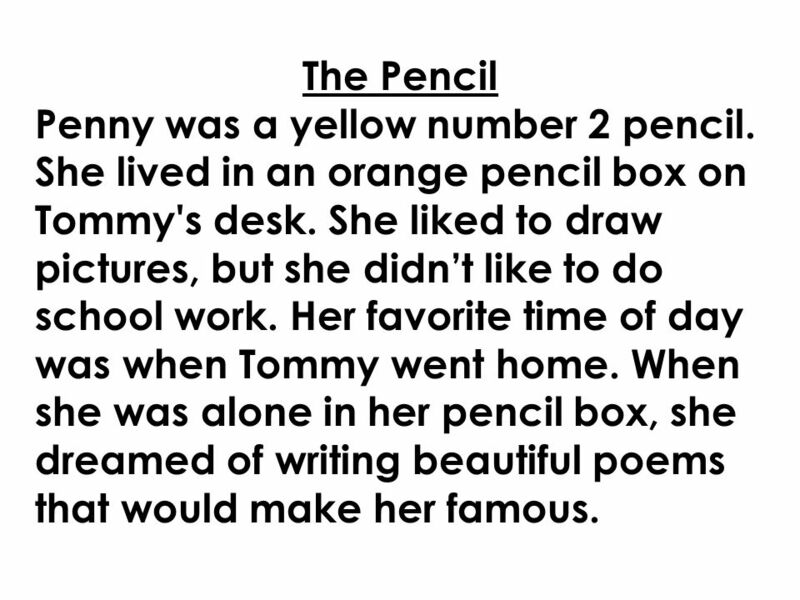 She lived in an orange pencil box on Tommy's desk. She liked to draw pictures, but she didn’t like to do school work. Her favorite time of day was when Tommy went home. When she was alone in her pencil box, she dreamed of writing beautiful poems that would make her famous. 11 1. What did Penny like to do? 4. What did she dream of doing? 3. When was her favorite time of day? 2. What didn't she like to do? 12 The answers to the questions are right there in what you are reading. 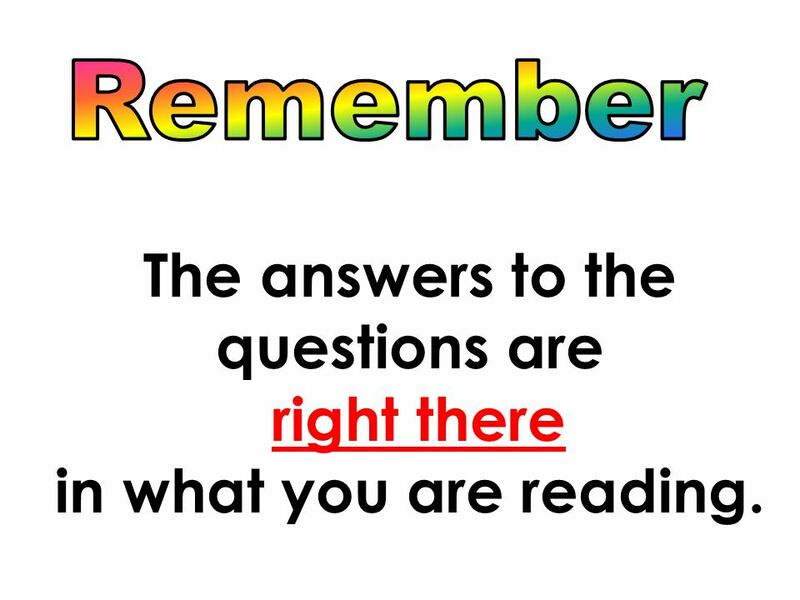 Download ppt "Read the question first, so you know what you are going to have to answer. Read the story slowly and carefully. Pay close attention to the facts. Read." My sister-in-laws camaro was stole someone must of broke a window to get in the car My sister-in -law’s Camaro was stolen; someone must have broken a window. Theme The Search for Meaning. What is a Theme? Theme: Life lesson, meaning, moral, or message about life or human nature that is communicated by a literary. 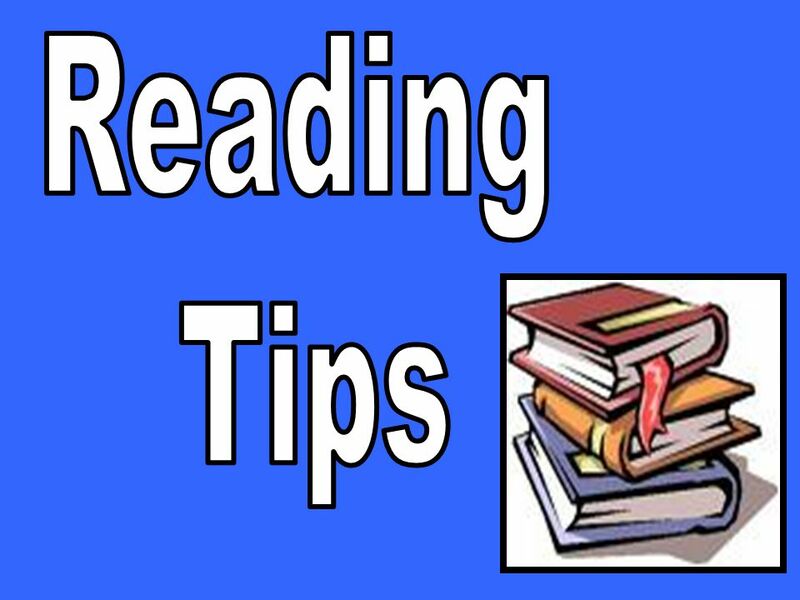 Reading Comprehension Helping your child understand the text. A beautiful smile Mr Deepak PRT KV2 SGR. MEASUREMENT 3.3. Measure each line segment. Should you use inches, or feet, or yards? Maybe you want to use centimeters, or meters. Think about which. Attention Test Look at the following picture for 5 seconds. What is Context?. Context is important because it helps us understand the full meaning of what someone is saying/signing. Two-Step Story Problems Our Goal: Solve problems that require more than one solution step.  Sit some place alone  Clear off your desk except for a pen or pencil  When finished, flip your quiz upside down and wait. Florence Nightingale By: Elizabeth Herndon Biography. Romeo & Juliet Act 1 Scene 4 1.Draw a picture of a dream you’ve had recently. This can be a dream you had when you were sleeping or a dream for the future. Lo- Develop strategies for calculating change from 20p, 50p, £1. StAIR - Division By, Kimberly Anglin. Today you will need…… A pencil Two different crayons Your math journal. Multiplication My favorite method is distributive! It is so easy! I really like the lattice method. It is fun to draw that box thing. Ya’ll are crazy!